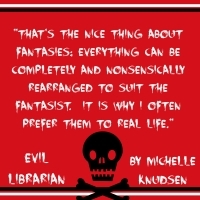 Evil Librarian by Michelle Knudsen is more than just a good book. It is a downright delectable read. And after getting to meet the author at the Rochester Children's Book Festival, it made the whole experience of reading this book even better! I can't remember the last time I read a book in the first person point of view that was this laugh out loud funny! The fact that Cyn (so similar to sin that I couldn't really ignore it) Rothschild is so upfront about who she is throughout the book is refreshing. There are some books where the narrator feels dishonest. But Cyn feels like an authentic high school girl. She isn't drop dead gorgeous. She doesn't have the typical qualities or features that make girls in books so frustrating sometimes. Unlike those other kinds of characters, Cyn doubts herself, yet tries to do what she can to save her school and her best friend from their evil librarian. She has an embarrassingly honest crush on a boy from school and a best friend that she loves so fiercely, I just had to smile at it all. Because I remember all of that: the embarrassing crushes that I still cringe at, the best friend that I still love fiercely almost nine years later, and the school musicals! I don't think you have to be in school musicals to enjoy this book. The way Knudsen thrusts the reader into the production of Sweeney Todd is more than enough! The production creates complex relationships and an added tension to the novel, which is truly spectacular. And like Cyn, I had a Mr. Henry. We all have those teachers that make an impact on our worlds and shape us into better people just by doing what they love. Knudsen's novel examines these relationships and brings a universal connection between reader and character. Despite the demonic forces at work in Cyn's school, it could really be any other school, and that's great! Bad things happen in almost every school, and Knudsen uses this fact to bring her characters, quite literally, to the precipice of Hell. All of this made me remember my own high school experience and I think that's wonderful too! I want a book to make me think not only of the characters, but to make me think of other things too. That is what's so fantastic about literature in general, but more specifically, this book. Knudsen has a plot that moves forward, but beneath that there is emotion and sacrifice and love and those are the things that I'll remember most. That and the absolute hilarity of Cyn's world. Books that combine such a witty narrative with real issues are winners for me and I hope they are for you too! So instead of struggling between a "good" book and a "bad" book, why don't you read a great book and face an evil librarian today!